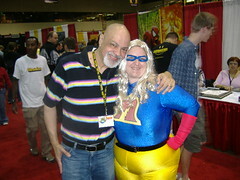 GEORGE PEREZ (Mar 2009), at MEGACON 2009, photo by Ross N.
Hey, cats and kittens! I'm over the con plague and prepared to report on Megacon 09! Megacon was held in sunny Orlando Florida from Feb. 27th-March 1st. This was my first trip down to Orlando for Megacon, so I went in really excited! Special thanks to the folks over at Comic Geek Speak for letting me crash on their floor! First off, panels! The only panels I attended were the daily DC Nation meetings. The first day featured Dan Didio and Jimmy Palmiotti discussing their career in comics and chatting with the fans. I had a ton of fun. Both Jimmy and Dan are very engaging, funny guys who really care about the fans, and it shows. The second meeting, on Saturday, featured an expanded panel of Dan Jurgens, Billy Tucci, Jimmy Palmiotti, Dan Didio, George Perez, and Ethan Van Sciver. The meeting started off with a very special event: George Perez birthday! 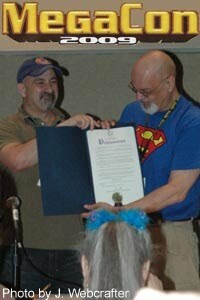 In fact, Dan Didio read out a document from the mayor of Orange County Florida, proclaiming that day George Perez Day! George told the audience that when he and Marv Wolfman were creating Starfire, it was their fervent hope that some lovely young lady would dress up as Starfire and show up to a con. Well, this certainly fits the bill! Prime Time Geek’s coverage of MegaCon 2009 continues with this recording of the DC Universe Panel, hosted by Senior VP and Executive Editor Dan Didio and featuring panelists Tony Bedard (R.E.B.E.L.S), Dan Jurgens (Booster Gold), Jimmy Palmiotti (Power Girl, Jonah Hex), George Pérez (Legion of 3 Worlds, Brave and the Bold), Ethan Van Sciver (Green Lantern: Rebirth, The Flash: Rebirth), and Billy Tucci (Sgt. Rock). Listed below are some highlights of the panel and the time index during the audio file when they occur. Enjoy! 3:00 - Dan Didio reads the official Orange County, Florida proclamation, signed by Orange County Mayor Richard Crotty, declaring Saturday, March 28th as George Pérez Day. 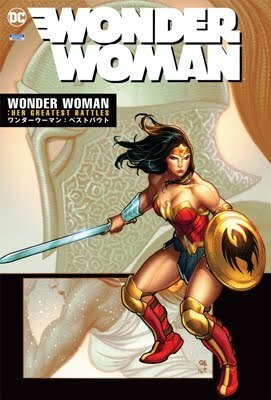 12:54 - George Pérez discusses Legion of 3 Worlds and tries to be vague about his next “epic” project. Dressed in costumes of their favorite heroes or shorts and t-shirts, fans filled up the Orange County Convention Center again today to see their favorite comic creators and television and movie stars as MegaCon 2009 rolled into its second day. The turn out was much larger than expected, and the lines for tickets sales were quite long. Inside, there was excitement in the air, and the floor was abuzz with news. With this year’s guest of honor, George Perez, as well as Dan Jurgens and Dan DiDio, The Hero Initiative booth has had lines all weekend. The first ever federally chartered, not-for-profit organization dedicated to helping comic book industry veterans who may need assistance with necessities or simply a helping hand back into the comics industry, The Hero Initiative has become an annual staple at MegaCon, and the fans always flock to their booth. Tabitha Johnson was excited about this year, talking about Friday’s “Lunch with Sketches” winners from e-bay, who bid to win a lunch and sketch from Perez and the two Dans. They also held their Hulk signing for their Hulk 100 special with 100 different drawn covers like those that they did with Spider-Man last year (some of the Hulk covers were on display at MegaCon last year). Today, George Perez and Dan Jurgens were at the booth all day signing, sketching, and talking with fans. The Hero Initiative also hosted the DC Universe panel, where Perez was given a very special surprise, in that Saturday, February 28, 2009 was declared by the County as “George Perez Day” in Orange County! Talk about a worthy tribute to a living legend! Sunday will see Perez and Dan DiDio at the booth all day. Johnson did admit that some MegaCon attendees were upset that the art auction usually held in Orlando each year was held at New York Comic Con this year, which raised for the Initiative a considerable sum of needed funds. They sold nearly everything they had, so they are ready to accept art donations for next year’s auction! See ladyjare's photos or profile. It was a sunny 70 degrees as Orlando welcomed back the Southeast’s premier comic convention today – MegaCon. And despite the tight budgets and economic concerns, there was still a line for tickets around the bend and out the door. Comic, anime, and sci-fi fans from all over weren’t about to let this show pass them by. Back in its old venue in the original Orange County Convention Center building, Mega Con 2009 boasted more space and a better layout than last year. Another MegaCon regular, Brian Pullido, was present and accounted for, promoting not only his Lady Death work, but also his new movie, The Graves. He reminded fans that 2009 marks Lady Death’s 15th anniversary, which first appeared in 1994. To celebrate, he had three Lady Death exclusives – Lady Death #1 Blood Edition, limited to 200 copies; Lady Death Moments #1 – MegaCon Edition, limited to 169 copies; and Lady Death Visions #1 with a George Perez cover signed by Perez [reported in error]. He did have seven new Lady Death stories through Avatar Comics, but he was unsure as to when those books would hit the shelves. He quickly moved on to his most exciting news, the movie he wrote and directed – The Graves, starring Bill Moseley, Tony Todd, Amanda Wyss, and D. Randall Blythe. He had a preview airing all day at his booth, and announced he should have it ready to go on the film festival circuit soon. Fans curious about this new horror flick can find more info at www.thegravesmovie.com. 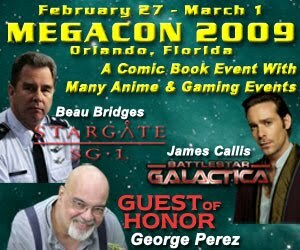 Advance tickets are now available to purchase for MegaCon 2009 being held in Orlando, Florida! Only a few weeks away, February 27 – March 1, you can obtain tickets from MegaCon’s website, mail in your request or call them at (386) 364-1826 to ensure your attendance. Then simply pick up your tickets at the Advance Ticket Booth window in front of Hall D, where the convention is being held. 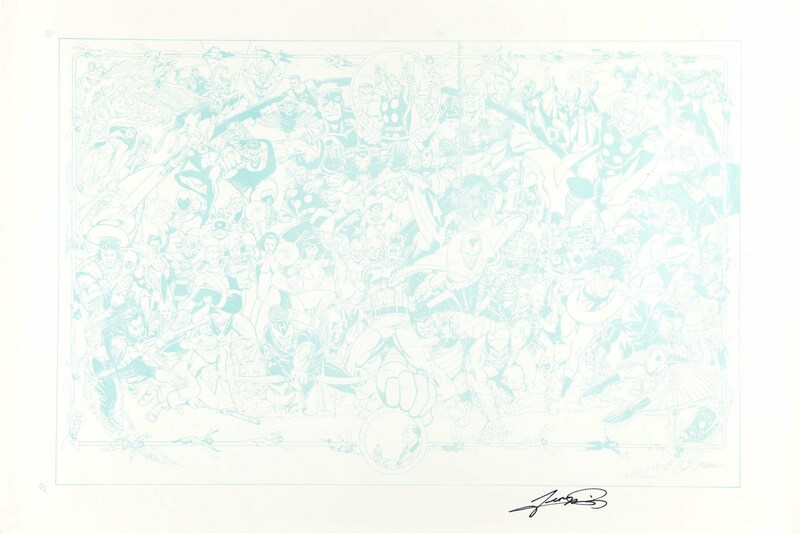 Special Guest of Honor for the event is influential artist George Perez. Perez is known for his work on The New Teen Titans, The Avengers, and Fantastic Four. Legendary MAD Magazine editor and artist Al Feldstein will be joining Perez as a guest at the con. Other artists include Frank Cho (Mighty Avengers, Ultimates 3, King Size Hulk), Jim Cheung (Young Avengers), Mark Waid (Fantastic Four, Gears of War), and many more! Project Fanboy Awards Nominees & Printable Flyer! Winners of the 2008 awards are scheduled to be announced at the Project Fanboy Awards Ceremony on Sunday, March 1st from 2:30 pm - 3:10 pm in Room 222A at the MegaCon comic book convention in Orlando, Florida. Darwyn passed along a couple of nice bits for me to share.